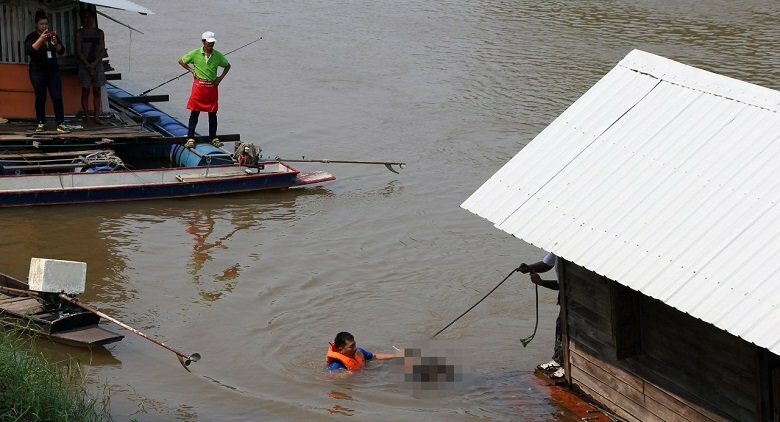 Mueang Phitsanulok police station was alerted at 10.30am that a body had been seen floating past the pier in front of Wat Phra Sri Rattana Maharat. Officials from a local foundation managed to retrieve the body about 2 kilometres downstream. The man was wearing Army shorts and a t-shirt bearing the name of Fort Somdej Phra Naresuan Maharaj, which is located in Phitsanulok. Police checked with the base and learned that the deceased was Thirasak Lansakul, 21, from Sukhothai, who had disappeared at 7pm on Saturday. A doctor determined that the conscript had been dead for at least 48 hours.